Whomp whomp. There're no Camille Noires for sale. Camille wears a black corset that hooks into her flesh as it lifts and separates. Her black fingerless gloves are nailed in place, and a wicked black neck brace holds her head up high. Barbed wire runs up her right arm, as well as circling her brow just beneath the blade. 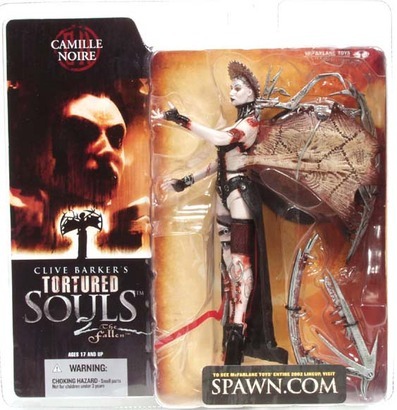 All I need to say about this one is that the has a freaking saw blade that rotates in the middle of her head!